Trump is right to be skeptical about military leaders’ plans for Afghanistan. Just because he was rude to his generals doesn’t mean he’s wrong to be skeptical about escalation in Afghanistan. Seated with National Security Adviser H.R. 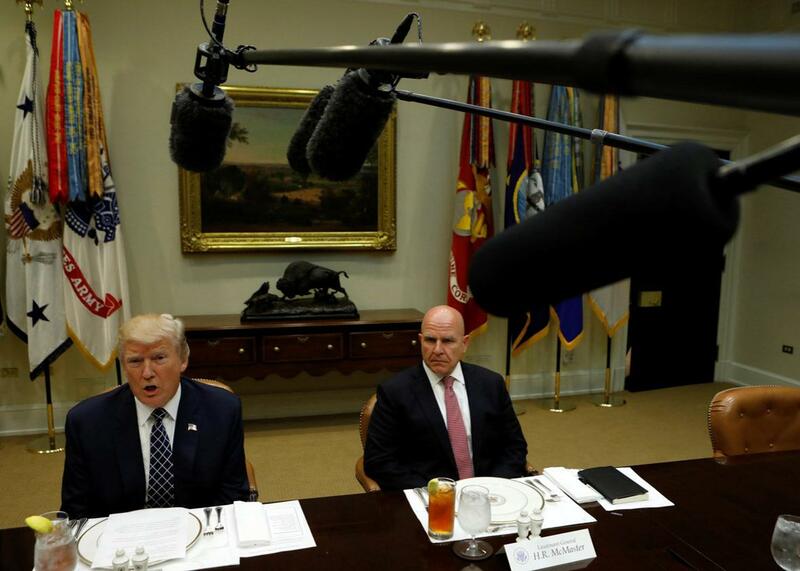 McMaster, President Donald Trump speaks during a meeting with service members at the White House on July 18. According to an incredibly detailed NBC News report of a highly classified National Security Council meeting, President Donald Trump unloaded on his top military leaders over Afghanistan in mid-July, questioning the war’s management and suggesting that its commander, Gen. John Nicholson, be sacked. Over the long and reportedly heated meeting, Trump broke norm after norm of civil-military relations, in roughly what might be expected from a man who displayed so much antipathy toward the military during his presidential campaign. Throughout the two-hour meeting, Trump appeared biased against the advice of his generals and Cabinet secretaries, going so far as to compare the military advice he was getting to bad business advice given to the management of the 21 Club, one of his favorite New York restaurants. He told the group that he had gotten better advice from a relatively junior group of troops he had lunch with at the White House days before the meeting. Trump likened these troops to the 21 Club’s waiters, who really knew what was going on at the restaurant as opposed to the clueless, high-priced consultants brought in by management. And yet, for all that he was a jerk, Trump wasn’t wrong to question the military establishment’s position on America’s longest war. The brass has gotten a lot wrong over the past 16 years of fighting in Afghanistan—from rotating units constantly to placing bases in dumb places to deciding on questionable strategies. Adding slightly more resources, or marginally changing the strategy, will not produce better outcomes much less victory (whatever that means). Even if he’s going about it poorly, Trump is right to question the fundamentals of a war that has already cost so much and achieved so little. And this is precisely the point to ask such questions: at the start of an administration, prior to the adoption of a strategy or commitment of more troops. The meeting at the heart of the NBC News report appears to have been a gathering of the statutory National Security Council, composed of the executive branch’s top Cabinet-level officials and chaired by the president himself. These full-up NSC meetings are rarely held and usually used to decide on a major strategy, or discuss responses to a crisis. Last month’s meeting capped weeks of lower-level conversations held without the president, not to mention a great deal of effort by military planners, to figure out the road ahead. National Security Adviser H.R. McMaster’s goal was clear: to get the president’s approval to send another 4,000 troops to Afghanistan and make an indefinite commitment to that country too. Unfortunately for McMaster and the other brass in the room, the meeting didn’t play out that way. Over two hours, Trump reacted poorly to being boxed in by the generals (who he very clearly and wrongly sees as his generals), a sentiment shared (if not overtly voiced) by President Obama. Trump’s frustration with the lack of progress boiled over in attacks upon Defense Secretary James Mattis and others. Trump reportedly felt there should be more to show for the six months of fighting since he took office (as if the 15 previous years hadn’t happened). Trump also fixated on the contributions of NATO allies to the fight and the potential extraction of precious metals from Afghanistan. Mattis reportedly returned to the Pentagon so upset that he took a long walk to think about the meeting. Joint Chiefs Chairman Gen. Joseph Dunford offered to broker a meeting between Trump and Afghanistan commander Gen. John Nicholson—who the president has yet to meet because he’s not yet visited Afghanistan (or Iraq). To be sure, Trump showed a startling lack of decorum and respect for his top national security officials. In dismissing their advice and privileging the views of junior troops over the generals, Trump is undermining the chain of command. He’s also depriving himself of the expertise and experience that all those generals earned while working their way up from being junior troops too. And, in mockingly comparing management of the Afghan war to that of a Manhattan restaurant, Trump denigrated the seriousness of the war itself, and the gravity of the decisions he must make that will have life and death consequences for Americans and Afghans alike. But that doesn’t mean Trump should treat the advice he’s given with skepticism, no matter the qualifications of his source. Trump is also right to try to objectively evaluate the situation today, notwithstanding our enormous sunk costs, to determine the best strategy. In deciding on a strategy, Trump should begin by deciding on our aims in Afghanistan. Despite (or maybe because of) 16 years of combat, these goals remain murky. It is unclear whether U.S. forces are currently focused on killing al-Qaida and ISIS elements, shoring up the Afghan government, or some combination of the two. In either case, it remains unclear what result would be good enough to satisfy U.S. interests. Realism must shape this choice of goals. The situation in Afghanistan continues to deteriorate, according to both American and international officials. U.S. sources estimate that Afghanistan’s government controls or influences roughly 60 percent of the country’s districts. Taliban forces continue to outmatch Afghan security forces, and U.S. combat advisers can only do much to support these Afghan units. In southern Afghanistan, where U.S. and British forces fought fiercely just a few years ago to beat back the Taliban, those gains have been nearly erased by successful political and military maneuvering by the Taliban, which now effectively controls Helmand and other nearby areas. At this point, given all that has transpired, the only realistic goal may be to pursue a narrow counterterrorism objective in Afghanistan, leaving broader questions about the country’s governance to its own leaders and forces. These questions have a political dimension, to the extent they will require the president to raise and spend political capital to support the war. Although the president has reportedly delegated authority on troop levels to the Pentagon (only to have McMaster curtail this delegation), he’s right to insist on some discussion of these at the NSC level. Ultimately, responsibility for the war rests with the president. Good strategy often involves trade-offs based on realism about objectives and the scarcity of resources. In Afghanistan, it is unrealistic to pursue a strategy that involves remaking the country in our image, or indefinitely supporting the government there. Former Vice President Joseph Biden and others were right that our interests are more narrow, and that a strategy focused on killing al-Qaida and ISIS elements is both more realistic and more appropriate. This necessarily abandons much of the current strategy and approach, as well as much of what has been done since 2001 by U.S. forces in Afghanistan. These sunk costs matter enormously and emotionally to the brass—but Trump is right to be skeptical. For their part, the brass haven’t always had the right answers to these questions, either at a strategic level or tactical level, in Afghanistan. Setting aside the political decisions made by Presidents Bush and Obama, and their civilian secretaries of defense, on strategic questions like whether to invade Iraq or whether to pull resources from Afghanistan to fight the other war, the generals have made many bad decisions at the tactical level in Afghanistan (and Iraq too). Choosing to deploy the Marines in Helmand over other more strategically important locations, placing combat outposts in vulnerable places where they could be overrun, running a piecemeal and inefficient strategy to train and equip Afghan forces, waiting years to implement effective counterinsurgency techniques, and rotating units and leaders too frequently through Afghanistan to be effective—these failures belong to military leaders more than political ones. This includes Mattis, who was one of the first U.S. commanders in Afghanistan in 2001, and later oversaw fighting there as head of U.S. Central Command from 2010 to 2013. The military leaders in the Situation Room with Trump have the most expertise and experience on Afghanistan of anyone—but that does not make them infallible. As the White House has cycled through personnel and dithered over strategy, the Afghan war has drifted, to the point where Mattis and most senior military leaders now publicly say the U.S. is not winning there. Trump must confront this reality and decide on a path forward. Wire-brushing the brass over the situation, or having lunch with troops at the White House, may help Trump feel better about what he’s doing, but it won’t affect the situation on the ground where U.S. troops are currently fighting and dying. Trump is right to ask hard questions of our Afghanistan strategy and our military leadership implementing it—but he must also realize there are no easy or quick answers where Afghanistan is concerned.